The actual finger joints make me more nervous than anything..i have a hard time with these being able to tell what the full range of motion is. 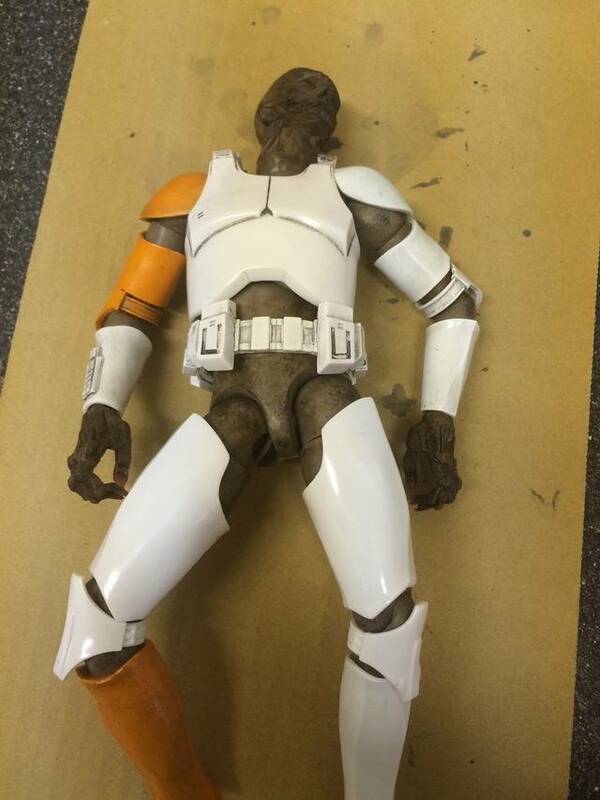 They are a great fit for the trooper look though. I dont think the F-Legion hands would have had the same effect. Can anyone with this in hand tell me about the black under suit he has is it all one piece? Or a shirt and pants? Yup, yup, yup, bro.. Long sleeve shirt and man sport leggings. Leggings like the kind Nike sport athletes wear. Regarding the articulation on the fingers: I'd handle them delicately at first 'til you get used to them and just in case you run into some paint lock you may want to use some heat in that case. But flexion on these fingers is pretty good. Obviously not as good as real human hands, but the fingers are made of the same soft material as regular TK gloves so they have some give to them. That is not to say they can't break; I'm sure they can given to the right person. Under armor! Thanks chivo, that'll make putting the armor I customized way easier to fit him with. Yep, Under Armour. If you get the chance when your done customizing, I'd love to see what you've done just for ideas. I'd like to add some armor on mine as well if I ever get the time. Sure thing! Here's the armor. 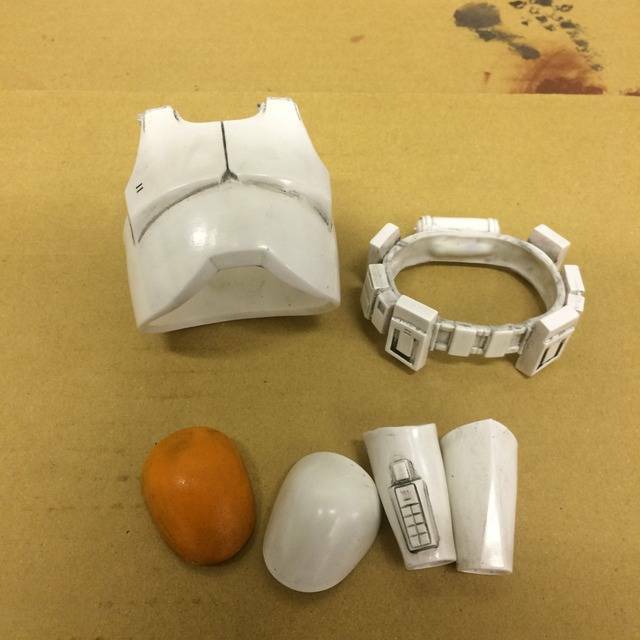 It's 1/6th medicom Clonetrooper armor. I tested it out on a naked Mumb. Not sure how much I'll actually use. Thinking just the pauldrons, gauntlets, chest and possibly the shin guards. We'll see. Awesome. Looks good. The body of the Sarge is black as well so the armor should work if it's too tight a fit with the black under clothing. Got Clean Noir Sarge today. Opened him up and thought he had a broken right arm. It was loose in the sleeve, i pulled it out and it must have just popped out of the elbow socket. Snapped it back in. Got my Dirty Sarge & Noir, love them. I'm jealous! Mine hasn't arrived yet. Still no sign of my dirty sarge. Anyone in Canada receive him yet? I'm reading DC's post above thinking "WTF did I miss", and then I remember. "Oh yeah..... I totally blocked that guy." I didn't block him and yet I don't see anything, so that must mean he was finally banned.... If so, what took the mods so long? Oh, and I got my dirty white but haven't opened him. Kinda debating whether to sell in order to partly fund UW Devastator, but I don't want to do something I might regret. i think he's pretty damn cool. the rifle is a bit of a burden, but otherwise pretty damn cool. Ok so I emailed CS and finally got tracking for my LSW today. But I'm a bit baffled by the tracking it's saying the origin country is the Netherlands, has ThreeA started sending their figures to the Netherlands for shipping? WTF? I hope he arrives soon. Says it left the origin country on the 8th of December. I'm baffled. Gimbat or Gregory can any of you confirm this Netherlands thing? Or anyone with this guys check their shipping label and see where theirs shipped from? I believe that is the forwarding courier. I'm not sure what/why the actual logistics reasons are (if it bypasses customs or what), but Canadian orders appear to be going through the Netherlands before hitting the country. Thanks for the quick reply Gregory. Weird but I'm glad it's a real thing. Back to waiting. I ordered 3' 2 showed up on separate days, and waiting on the 3rd. Grish wrote: Nothing this week.